Today on The Gottman Relationship Blog, we continue our Summer Romance series by sharing a list of fun, summer-related date ideas for reconnecting with your partner this weekend. While seeing an outdoor movie together or going for a picnic is wonderful, we challenge you to take things one step further by actively turning towards each other throughout your outing. What does that look like? One of the greatest predictors of your relationship’s success is your ability to turn towards each other, constantly developing your bond by making an effort every day to reach out to your partner and accept their bids for emotional connection. We have found that the majority of conflict in relationships is the result of turning away from and against these bids. Turning away and against are related to both suppressed negativity (sadness, self-pity, stonewalling) and being in the attack-defend mode (anger, criticism, contempt, defensiveness, belligerence). Playful bids and enthusiastic efforts to turn towards each other result in heightened levels of positivity during conflict discussions. They also help you to build up your emotional bank account, maintain a strong and healthy bond, and bring the fire back into your romance. In his research, Dr. Gottman discovered that the “masters” of relationships display a way of scanning their environment to find ways of appreciating their partner. In other words, they “catch” their partner doing things right and compliment them on it. Just as building your Love Maps are a great way to strengthen your friendship system, as we discussed on Monday, making a conscious effort to turn towards each other’s bids for emotional connection will strengthen the emotional connection felt between the two of you. Go camping: Get away from the stress of work and retreat to the wilderness. Even if it’s just for one night, sleeping out under the stars with only the company of each other will remind you of what’s most important – your relationship. Go kayaking: Rent or borrow a couple of kayaks and spend the afternoon or early evening exploring local waterways. Moving slowly through the water in a wind or human-powered craft will reduce your stress level, give you and your partner a chance to ask each other open-ended questions, and increase your chances of spotting some wildlife. Have a picnic: Pack a couple sandwiches, a bottle of wine, and a blanket and head to the nearest park. Even if it’s just around the corner from your house, the change of scenery will be a refreshing variation from your weekly routine. For more turning towards: Stop by your local grocery store and pick out picnic items for each other – do you know your partner’s favorite sandwich? Their favorite snacks? Their favorite drink? If not, here’s a great opportunity to learn! Attend an outdoor movie: Pack a blanket and get ready to watch some of your favorite films on a big, outdoor screen. Best of all, most screenings are totally free. Check your local listings. Go for a walk/hike: It may sound simple, but a long walk is still one of the best summer dates you can have. Whether it’s a scenic weekend hike to a waterfall, a hilltop viewpoint or some other specific destination, or just an evening stroll through a favorite neighborhood, there’s something about taking a walk together that is guaranteed to bring you closer. For more turning towards: Bring your Love Map Card Deck and take turns asking each other questions. Go for a bike ride: Take advantage of the nice summer weather to tune up your bikes, dust off your helmets, and get back out there. Make a date to do one of your favorite rides or try a new one that promises great scenery and enough challenge to get your blood moving. Pack a lunch and make a day of it! Attend an outdoor concert: Great music sounds even better when you have the opportunity to hear it outside in the open air. Never heard of the group performing? Even better! Discover new music together, creating a lasting shared memory. 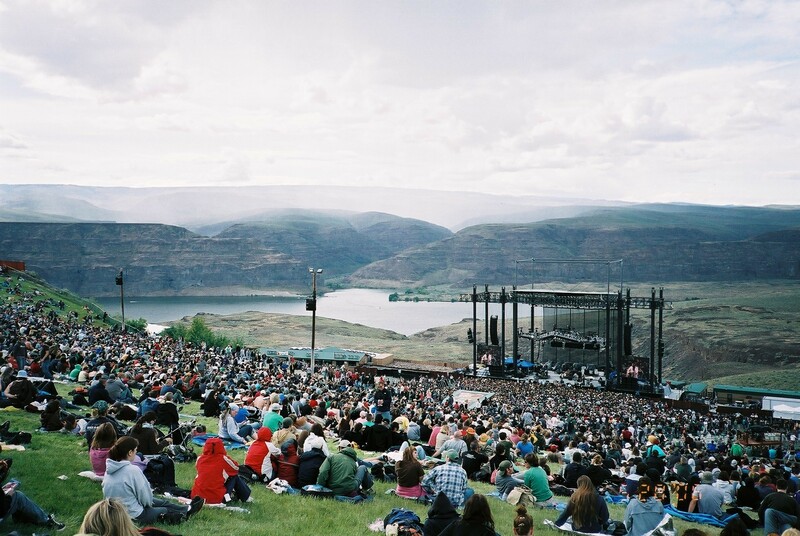 Many parks, wineries, and even zoos now host outdoor concerts, and there are a number of major concert venues that are designed to take advantage of their natural settings and spectacular views (See: The Gorge Amphitheatre in Washington State). Attend a baseball game: Whether you are a fan of the game or not, the pace of baseball makes it the perfect spectator sport. Sit back, relax, and watch the game while engaged in deep conversation. For more turning towards: Share stories from your own athletic career. Did you play sports? What was your most proud moment? Your most embarrassing? Visit a farmers market: In many places, the return of summer also means the return of the local farmers markets. Go early to get the best selection of local fruit, vegetables, and other produce. While you’re there, sample local honey, preserves, and baked goods, and check out all the different crafts. We’ve said it before and we will certainly say it again: it is the small things done often that make the most difference in a relationship. Whether you are out on a bike ride or attending a baseball game, make it a priority to turn towards each other’s bids for emotional connection this weekend. Like the rest of us, "Masters" of relationships are only human. There are moments at which they feel driven to distraction by their partner's personality flaws, and the little hairs on the backs of their necks stand up (yes, they have those t00). Last week, The Huffington Post published an article featuring our research – a very well written, comprehensive piece about the Gottman approach to managing physiological and emotional flooding in relationship conflict. Ideally, successful conflict management in your relationship ends with both of you hearing each other's positions and understanding the dreams hidden beneath the surface of your disagreement.